This five-year, $2.7 million grant will allow more than 100 St. Louis area public school teachers from Parkway Schools, Ritenour School District, and St. Louis Public Schools to complete the coursework required by Missouri’s Department of Elementary and Secondary Education for English Language Learner (ELL) Certification. In addition to coursework, cohort members participate in a series of eight Saturday Seminars with a focus on family, parent, and community engagement. Webster faculty in Teaching English as a Second Language (TESL) have been collaborating with the International Institute of St. Louis and St. Louis Mosaic Project to develop a new curriculum of eight seminars in a Teacher-Student Success Network. “Rather than use existing research developed in other contexts, we wanted to develop a framework that would allow St. Louis-area teachers to identify challenges and then develop their own plans to address questions concerning family, parent, and community engagement to support success for English language learners,” explained DJ Kaiser, associate dean for the School of Education and project director for this grant. Webster accepts applications from certified teachers in partner districts that are serving English language learners. Cohort members make a two-year commitment to the project to complete seven TESL courses, the Saturday Seminars, a series of classroom observations, and blog postings. On April 6, 22 teachers comprising the first two grant cohorts will present their final group projects at Webster University. These projects combine teachers’ experiences in their schools with knowledge gained through TESL coursework; panel discussions with students, parents, and school staff; and reflective activities. Another 27 teachers will continue with activities focused on the role of the school in promoting success for ELLs. “Every single participating teacher brings untold school-related experiences to the table which promote motivational behavior and ideal engagement of other teachers towards the success for our ELL's,” related Soheil Mansouri, visiting assistant professor for the Graduate Department of Education. Data from the Missouri Department of Elementary and Secondary Education show a more than 200% increase in the number of ELLs in Missouri public schools since 2000. National data from the Office of English Language Acquisition shows that Missouri ELLs have a high school graduation rate of 68% in comparison to 89.3% for non-ELLs. “This grant project is designed to meet the increasing demand for ELL teachers in Missouri schools and demonstrates Webster University’s commitment to serving unmet needs in our community,” noted Thomas Cornell, interim dean for the School of Education. Webster’s School of Education has already been the recipient of a prior National Professional Development grant with the Kansas City Public Schools to support English language learners (2012-2017) and the “Mind Full of Words” PNC Foundation grant to support early childhood learners and their families in University City and St. Louis (2016-2019). 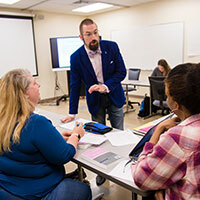 Webster, in a collaboration between the School of Education and the College of Arts and Sciences, was also recently awarded a National Science Foundation capacity-building Noyce grant to recruit and increase the number of STEM teachers in high-need schools. Moving into year three of the current National Professional Development grant, Webster University plans to admit approximately three dozen teachers from Parkway Schools, Ritenour Schools, and St. Louis Public Schools to begin a new two-year cycle of robust professional development to serve ELLs. Teachers, schools administrators, and university faculty and staff are encouraged to attend the final group presentations from cohorts 1 and 2 on April 6, at 1:30 p.m. in Browning Hall at 8274 Big Bend Blvd., St. Louis, MO 63119.